Lexon Design, imported from France. 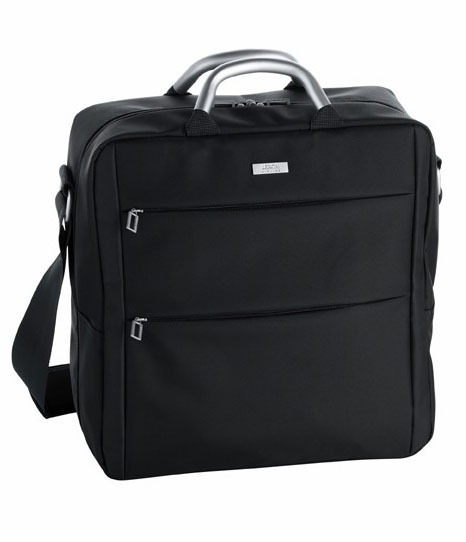 Lexon Men's travel & business tote in black. A great designer tote for business- or leisure travel. Perfect for anyone who demands order and organization, this lightweight black microfiber bag has a stylish look and two side pockets for just about everything. Designed to fit with ease into the overhead bin or under the seat in front of you. The stylish carry-on luggage bag is carry-on size to avoid paying extra airline fees. Zipper closures keep contents secure. Check your bags but carry your essentials onboard with this soft sided yet sophisticated carry-on tote. This compact, lightweight and durable microfiber bag features a spacious, zippered design with organizational side pockets for small items, plus plenty of room for your short trip and in-flight necessities. Perfect for a passports, ipad, smaller laptops, small purse, phone, wallet, duty-free merchandise, etc. Two side pockets provide storage for smaller items. Padded shoulder strap with aluminum hardware. Lexon, founded in Paris in 1990, reflects a commitment to the highest level of functional design, represented in a Collection of unique consumer products that include accessories for the office, travel, sports, home, and for personal use. The emphasis is on design, quality, and value.